Price is per 16-inch strand of these beautiful beads - ready for stringing. Largest size: 20mm x 9mm - about 26 beads to the strand. Genuine Chinese coral, dyed red but colour fixed. Lighter red in real life than the picture. 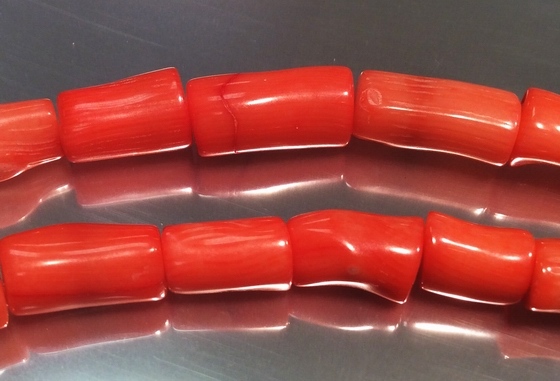 Its color ranges from white to red, but most red coral these days is dyed. It grows in branches that look like underwater trees. Most people think of coral on the coral reefs in the South Pacific like the Great Barrier Reef. However, these reefs are formed by a different species than the coral traditionally used in jewellery. Most of this coral is found in the Mediterranean Sea or in the Pacific off Japan and Taiwan.